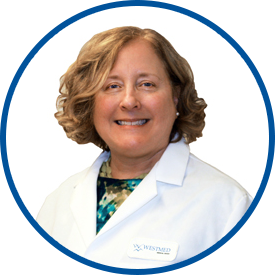 Dr. Kaminski is a board-certified ophthalmologist. Her fields of interest include diabetes, glaucoma and dry-eye syndrome. She attends patients of all ages. She received her bachelor of arts degree in human biology and her master of arts degree in physical therapy from Stanford University. She was awarded her medical degree from Georgetown University Medical School, where she was elected to the Alpha Omega Alpha Honor Medical Society. Dr. Kaminski completed her internship in internal medicine at Washington Hospital Center. She then returned to Georgetown University Medical Center for her ophthalmology residency, during which she served as chief resident at District of Columbia General Hospital. Prior to joining Westmed, Dr. Kaminski operated a comprehensive ophthalmology practice in Yonkers for 24 years. She previously worked for the Southern California Kaiser Permanente Group in Los Angeles as a general ophthalmologist. Dr. Kaminski is affiliated with Lawrence Hospital in Bronxville. Dr. Kaminski was both very knowledgeable and thorough, excellent attributes for a doctor. Dr. Kamiski is an excellent doctor and her staff is top notch. I have complete confidence in Dr. Kaminski. She is very thorough and professional. I would recommend her to anyone. I recommend Dr. Kaminski to all my friends. She is an excellent and caring doctor!